Synopsis : Researchers warn that a combination of nanoparticles and contaminants may form a cocktail that is harmful to our cells. Nanoparticles in our environment may have more harmful effects than we think - Researchers warn that a combination of nanoparticles and contaminants may form a cocktail that is harmful to our cells. In their study, 72% of cells died after exposure to a cocktail of nano-silver and cadmium ions. Nanoparticles are becoming increasingly widespread in our environment. Thousands of products contain nanoparticles because of their unique properties. They have an effective antibacterial effect and can be found in refrigerators, sports clothes, cosmetics, tooth brushes, water filters, etc. Professor Frank Kjeldsen, SDU, has lad a cell study, that, in his view, causes concern. The study is published in Nanotoxicoloy. There is a significant difference between how the cells react when exposed to nanosilver alone and when they are exposed to a cocktail of nanosilver and cadmium ions. Cadmium ions are naturally found everywhere around us on Earth. 72% of the cells died, when exposed to both nanosilver and cadmium ions. When exposed to nanosilver only, 25% died. When exposed to cadmium ions only, 12% died. 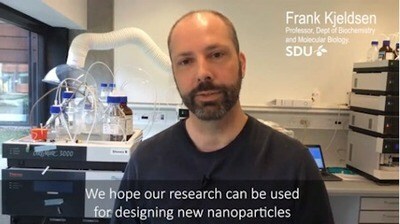 Professor Frank Kjeldsen, University of Southern Denmark, talks about his research into, and concern about metal nano particles. - Film Credit: University of Southern Denmark. This study indicates, that we should not look at nanoparticles isolated when we investigate and discuss the effects, they may have on our health. Products with nano particles are being developed and manufactured every day, but in most countries there are no regulations, so there is no way of knowing what and how many nanoparticles are being released into the environment. In my opinion, this should be stopped. Other studies, led by Professor Kjeldsen have previously shown that human cells interact with metal nanoparticles. One study showed that nano-silver leads to the formation free radicals in cells and changes in the form and amount of proteins. Many serious diseases are characterized by an overproduction of free radicals in cells. This applies to cancer and neurological diseases such as Alzheimer's and Parkinson's. His research into metal nano particles is backed by a ERC Grant of 14 m DKK. Project title: Formation and Characterization of Protein Post-Translational Modifications and Assessment of Cellular Responses by Application of Metals in Biological Systems. *News Release by University of Southern Denmark: Disabled World makes no warranties or representations in connection therewith. PR content may be edited for style, clarity, and/or length. If you are connected with this page and want it corrected/updated please contact us.